Could this be the best 4-season, 2-person tent in the world? Reasonable interior height for me 6' 2"
As soon as I saw this tent pitched I knew it was the "business". 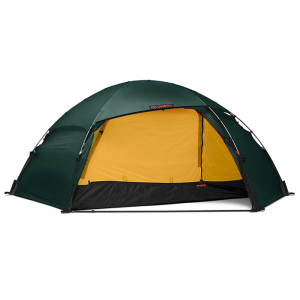 It's a Hilleberg Red label tent which is 4-seasons. 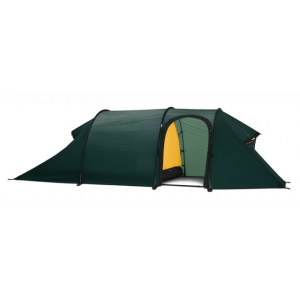 There is an Arctic Black Label version that is near identical except that the doors are diagonally opposed And the fabric and poles are stronger and heavier. You choose. In my opinion the Allak Has has a better door arrangement. As I mentioned above the vents are excellent and can be controlled from inside the tent. There are many different options. The fact that the two doors have zippered mesh/fabric panels, with the fabric zippered back you don't need to buy a mesh inner for summer. These two meshed doors allow marvelous flow through ventilation in hot weather. The pole sleeves are supplemented with clips. This avoids the tedium of pole threading I have with my Hilleberg Unna. i have not found anything in the instruction manuals or videos which give a tip for placing the poles. There are three identical poles, but the three sets of sleeves are not identical. Make sure that the pole that is threaded through the red labeled sleeves is the highest in the pole intersection area. That red pole has fewer pole clips in the intersection area because it is meant to be the highest above the tent. 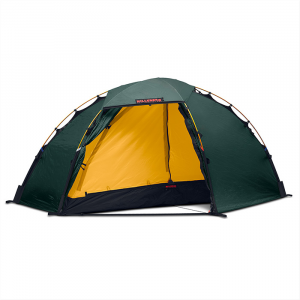 Another major advantage in this tent and in fact all Hilleberg tents, is that the inner and outer pitch together. If you pitch in the rain, the inner doesn't get wet! As with all Hilleberg tents it is signed by the seamstress who sewed the tent in Estonia - not China. 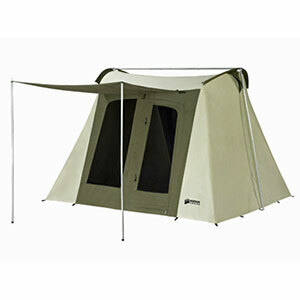 tent is marvelously well designed and constructed. Highly recommended. Pitching in windy conditions is very easy. 1/21/19. 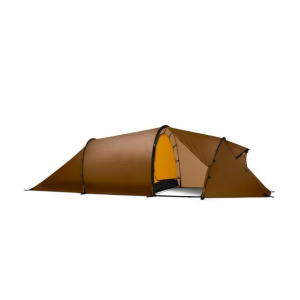 Pitching the Hilleberg Allak. Extremely easy to pitch even in high winds or rain. Stake out the base in its final form. Then insert the poles in the (short) sleeves. If windy, guy out the poles already. Then circle the tent clipping the poles ever higher. Next if windy, attach the second guys to the poles using the pole wrap technique. Lastly attach the roof fly cover. All this can be done without wetting the inner which is attached to the outer. The two fabric or mesh opposing doors can provide, together with the two large roof vents, excellent cross flow ventilation in hot weather. 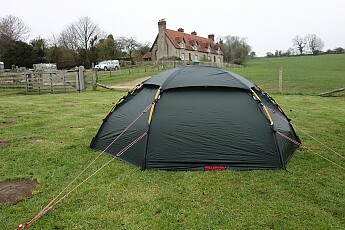 The key thing with the Allak is that the tent is always stable during pitching....at every stage. Thanks for the helpful review, Denis. Got any pics of yours you could share in your review? Good review Denis. I agree with the slight annoyance of the poles in the Unna sleeve but I find the Unna superior due to the poles not being exposed. At least here in Canada, and the cold, the exposed poles on the Allack can become frozen together and they are very difficult to get unstuck! I had not thought of that. Not likely to be a problem here. This would also be a problem for the Arctic Staika. Second outing was into a night of heavy fog. In my experience heavy long lasting fog is worse than heavy rain in terms of wetting the interior of you tent. I have had bad experiences in the past with other tents. How did the Allak fare? No problems. I had the outer flush with the ground to keep the fog out. The upper vents were open under the rain cover. I woke up completely dry. This tent took the weather in a dawdle. Third outing: piece of delightful cake. I understand the concern about ice forming on the poles in icy Canada. Worthwhile consideration. In Australia this will rarely be a concern and is balanced by the easy setup of the Allak rather than the Unna - which I also own. The Allak's combined qualities of being fully free-standing (including lobbies), having an all-in-one pitch (including footprint), and managing true four-season endurance is pretty irresistible; especially to those like me, who—only too often—find they have to pitch their tent fast in weird inhospitable places in fading light and driving rain. 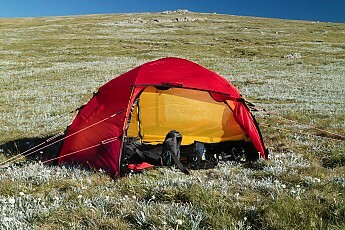 I chose the Allak above Hilleberg's Staika (same sort of thing, heavier, even stronger) and Soulo (very similar specifications but 1-man) due to its breadth of abilities and—for me—perfect size: the Allak is a not ungenerous tent for two six-footers, with just enough elbow room, sitting height, and independent lobbies—each of which will take a big backpack, waterproofs, and boots. The Allak can be given extra depth of performance by double-poling for heavy weather: this simple feature allows it to resiliently and fairly quietly cope with gusty winds in the 40-50 knot range; whereas, single-poled, I find the large panels deflect too much, eventually causing the poles to flex more than one wants to witness. Designed for kayakers in an archipelago of small rocky islets, the Allak is fully free-standing so can be set down on a slab of rock; this also makes it a decent tent for the mountains. The tough footprint can be left attached to the fly/inner assembly, so making for a really fast all-in-one pitch on dodgy surfaces, and for a protective outer skin when the tent's rolled up. The fly and inner are connected tautly and elastically at a large number of points, making the inner relatively airy, and reducing contact-transfer of condensation and drips; this is also helped by the Allak's fairly taut pitch. Though the cost and weight are bearable for such a fine tent; and though I have firsthand experience of Hilleberg's superb customer service (with another tent); I must say I find Hilleberg's insistent badging a bit naff. Welcome to Trailspace, Stephen! Thanks for sharing a helpful review of your Allak. I'd love to see some pictures of your tent setup, if you're willing to add some to your review. Thanks for the pictures, Stephen. the giant tomato. 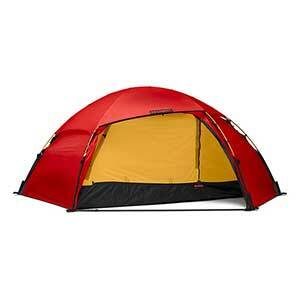 that's what the red version of this tent looks like. lol. my first experience of using this tent was in mid-January, at a scout camp in south-east nebraska. no snow on the ground, but the ground was still frozen. air temp was 0-degrees the first nite with no wind. 24-degrees the second with a light breeze. 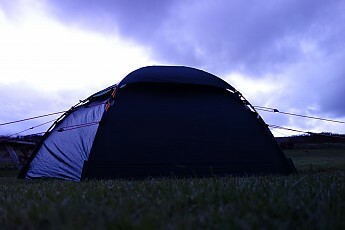 on purpose i set the tent up in the dark, with my 12-year-old holding a headlamp. it took me less than 5 minutes to set the tent up. the external poles make it super simple. i did not stake the tent down before setting up, due to a lack of wind, i didn't stake the tent down until night 2. the tent camp with 2 sets of stakes, one "V" shaped and another that look like big nails. because i wasn't thinking and used the "V" shaped pegs in frozen ground, 3 our of the 6 bent. i should have used the others - big dummy. once zipped up, tight, no condensation except around the "air-hole" on my zipped up tight sleeping bag. nothing on interior walls or my feet or anywhere else. loved that. first experience with this tent was awesome. i'll update my review when i have used it more. I have had an Allak for two years or so, and have solo camped in all four seasons. This is the best tent I will ever own! This tent has room for me and my gear, great sitting-up room, and after just a few times setting up in all kinds of weather (the video at Hilleberg helped) I can be snug in the Allak within 5 minutes. Never have had condensation problems.